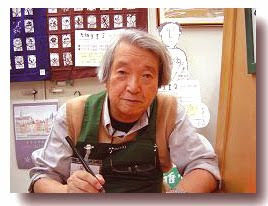 Anno is best known for wordless picture books featuring small, detailed figures. In the "Journey" books, a tiny character travels through a nation's landscape, densely populated with pictures referencing that country's art, literature, culture, and history. Anno's illustrations are often in pen and ink and watercolor, and occasionally incorporate collage and woodcuts. They are intricately detailed, showing a sense of humor as well as an interest in science, mathematics, and foreign cultures. They frequently incorporate subtle jokes and references. My dad had several of Anno's books when I was a kid and they were truly impressive. I recall pouring over the fine linework and detail he would put into every page. Despite the stories being entirely wordless, they told very clear and concise tales and, in retrospect, very clear comic work told in an extraordinary manner. I don't think I've ever seen Anno's name in association with comic book storytelling, and thought I ought to call some attention to his work for those who've never really made the connection between his work and the comic medium. My personal favorites were Anno's Italy, Anno's USA and Anno's Britain. Really masterful work, well worth seeking out.